Most of the predictions of cold dark matter agree very well with observation, which is why it is a dominant part of modern cosmology. But there are aspects of the dark matter model that don’t agree well with observation. Take, for example, the clustering of dwarf galaxies around the Milky Way and Andromeda galaxies. According to the dark matter model, dwarf galaxies should form within small clumps of dark matter, and they should be randomly distributed around their parent galaxy. We can test this idea by looking at the distribution of galaxies around our own Milky Way galaxy, and a few close galaxies such as Andromeda. There have been some studies of dwarf galaxies that have shown that their distributions are somewhat random, but a new study published in the Monthly Notices of the Royal Astronomical Society has found that they aren’t really that random after all. The team analyzed the positions and motions of dwarf galaxies orbiting Andromeda and the Milky way, and found that they tend to orbit within a broadly similar plane around their parent galaxy. Now it is possible that this similarity of motion happened just by chance, so the team then compared these motions with computer simulations of galaxies to determine the likelihood of such an orbital arrangement. 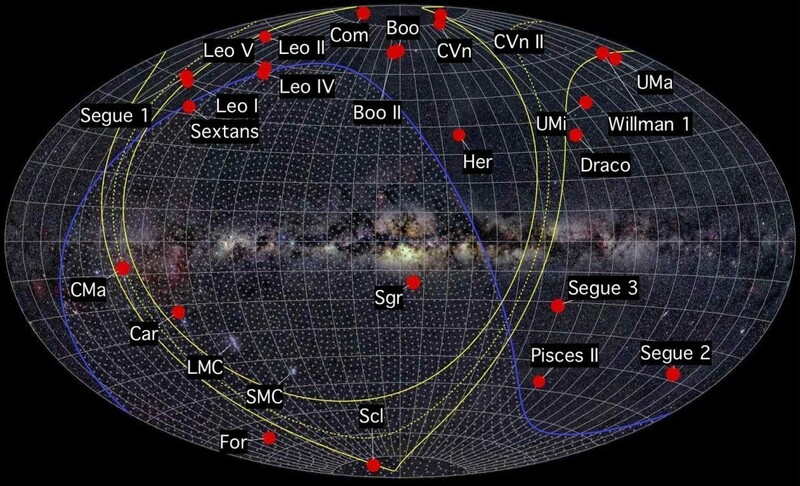 What they found was that the odds of dwarf galaxies being arranged in this way purely by chance is about 1 in 1000. That doesn’t put it out of the realm of possibility, but it does make the arrangement seem a bit odd. So it seems that either the Milky Way and Andromeda just happen to have unusual dwarf galaxies, or there is a mechanism we don’t understand. These are only two galaxies, so it isn’t enough evidence to overturn dark matter, though it does seem that the more data we gather the more unusual the situation becomes. But this is a good thing. The more observational data we gather, the better chance we have of either confirming or ruling out dark matter candidates. Hello Brian! Thanks for the interesting information! Do the results of this survey contradict only the notion of CMD (cold dark matter) or the other candidates for dark matter either? Except for some possibly exotic versions of dark matter, none of the models would account for this clustering of dwarf galaxies.